Both Hereford United and Barnet have difficult LDV Cup games this week before playing each other at Edgar Street on Saturday. Hereford United take on Doncaster Rovers on Tuesday, but at least this game is at Edgar Street with a 7.45pm start. Barnet have to travel to Bristol Rovers and that game doesn't take place until Wednesday evening giving the Bees one less day to recover before Saturday's clash. Neither Conference side will be favourites to win against higher league opposition but of the two perhaps Hereford could be the team to pull off a shock result. The Bulls defeated Scunthorpe, who are now top of League Two, in the previous round after the game went to penalties. Doncaster had Doolan sent off on Saturday and have several players injured. Hereford will again miss Rob Purdie, out with a groin strain, but appeared to come through their Cup game on Saturday without any other injury problems. Hereford supporters will remember the last time Doncaster came to Edgar Street on the last day of the 2002/3 season when the Bulls were beaten 4-2 and Donny Chairman, John Ryan, came on as a substitute late in the game at the age of 52. Doncaster were promoted from the Conference after their win at Edgar Street whereas on the previous Monday Hereford travelled to Southport and sent the home team out of the Conference after defeating them 2-1. The Bulls return to Southport for the first round FA Cup on November 13th. A win for Hereford is understood to be worth £4,000 in prize money. Graham Turner, the Hereford United manager, told the Non-League Paper of his relief at going through to the first round of the FA Cup. "My mind always goes back to a tie a few years ago when we were 2-0 up against Newport, Isle of Wight and then lost 3-2. "So when the last five minutes should have been comfortable, they ended up nervous. But we had more than enough chances to win the game comfortably and the Radcliffe keeper did very well." Meanwhile the Hereford United under 18 team lost away to West Brom 5-1 in a South Central Conference game yesterday. Ben Scott, interviewed after the game by BBC Hereford and Worcester, thought it had been a good victory for the Bulls. "They did go hell for leather after they scored their consolation and started lumping it up. "But all credit to them, they've come here and tried to make a game of it so it's been a good victory in the end. Asked how pleased he was with his performance, Scott replied:"For my second game I enjoyed it. We're a good team. It really just a team game. I thought I did well just like the other lads on the pitch did as well." Ratcliffe Borough's goalkeeper and the goal posts kept the visitors in the game at Hereford this afternoon as Lee Mills was unlucky not to score a hat-trick. 23 year-old Danny Hurst was between the sticks for Radcliffe. Now in his 5th season with the team after signing from Cheadle Town in the summer of 2000 it is surprising that he hasn't played at a higher level. He made several excellent saves this afternoon and would be their man of the match. Kevin Glendon, the Radcliffe manager, told Bulls News earlier this week that in his opinion Hurst was the player to watch. "Danny has been recognised as one of the best keepers in non-league football and such recognition has ensured several league clubs have looked at him, notably Manchester City and Sheffield Wednesday," said Glendon. Graham Turner signed a new goalkeeper, Craig Mawson, late on Thursday initially for a month. If, for some reason that doesn't work out, he might even consider Hurst who probably could earn a place with a team in a higher league. Hereford United eased past Radcliffe Borough in the F.A. cupt fourth qualifying round this afternoon, although the result was less than convincing. The Bulls, who hit the woodwork three times, only managed to defeat Radcliffe 2-1. Borough gave a good account of themselves in front of their 81 supporters. Hereford made two changes to their side, Tony James, as expected, returned in place of Andy Tretton and Lee Mills recovered and played in place of Rob Purdie who has a groin strain. United had the majority of play, and created nearly all of the chances in the first half. However poor finishing resulted in a half time score line of 1-0 to the home side. Early on Brown crossed for Mills whose header was saved well by the impressive Danny Hurst, who was a major reason in the close result. Craig Stanley went close with after a short free kick before Mark Robinson crossed for Mills who won a corner from his shot. Tamika Mkandawire almost opened the scoring with a far post header, but it was just wide. Andy Heald put in a dangerous cross for Radcliffe that deflected over off Mkandawire in a rare attack for the away side before Adam Stansfield won a corner after a good run and shot at the other end. Radcliffe's best chance of the half came after some good passing in the midfield resulted in Gary Sampson getting a shot away that was well saved by Ben Scott. Stansfield was played in on goal after Stanley's pass had split the defence, but he could only find the side netting with just the goalie to beat. Mills shot just over from twenty yards and Mkandawire went close again from a Robinson corner. A simple short corner resulted in Hereford breaking the deadlock 31 minutes through the first half. Robinson layed the ball off to Stanley whose powerful effort was palmed into the path of Mills who made no mistake volleying in from close range. Man of the match Lee Mills was again involved when setting Simon Travis up, but Travis struck just wide of the far post. Stansfield then linked up with Mills, and the experienced attacker broke away from two defenders and hit the post with just the 'keeper to beat. Andy Heald then surprised everyone and hit the post from the left channel for Radcliffe. Robinson hit a free kick from twenty five yards that was tipped over well by Hurst in the last action of the half. Stanley started the second half with two efforts from outside of the box, the first forcing a good save from Hurst. Hereford turned on the style with some superb passing resulting in Brown finding Mills, who turned his marker well and smashed the outside of the post from fifthteen yards. Brown found Stansfield on the left, and he paced into the box only to see his shot saved, and then Stanley had a shot blocked that rebounded to him and he hit wide. Mills set Ryan Green away on the right wing with a neat chip and Green squared the ball to Travis who had the simple task of finding the back of the net from eight yards making it two - nil to the Bulls. Tony James won the ball on the half way line and delivered a perfect pass to Travis who was unmarked on the right of the box. His first time effort hammered the frame of the goal. Radcliffe, in one of their few attacks of the half, gave themselves a lifeline after a superb passing move. The ball was passed at least 12 times between the team as they moved up the field and a shot from twenty yards forced a good diving save from Scott, but second half sub Patterson was on hand to fire in the rebound. Hereford, who made two changes in the second half, Brown off for Danny Williams and Travis off for Graham Hyde, didn't look to be overly troubled by their opponents attempts for an equaliser. Green crossed for Stansfield whose effort was once again well saved by Hurst in United's last notable attack on goal. Radcliffe gave a very good account of themselves for a side at the wrong end of a league two divisions below Hereford. The majority of the crowd of 1,788 would have been disappointed that the Bulls didn't convert more of the chances that they created. Had it not been for a fantastic display by Hurst in goal for Borough the final score may have been slightly embarrasing for the Unibond Premier side. After defeating Radcliffe Borough 2-1 this afternoon, Hereford United travel to Southport in the first Round proper of the FA Cup. The tie is due to be played on November 13th. After dropping Captain Tony James for the trip to Carlisle last week, Hereford United manager Graham Turner has labeled his centre half as "the best central defender in the Conference". Speculation ripened that James may be on his way out of Edgar Street when he was left out last week, but Turner has told the Evening News that he is staying put, for now at least. "You can never take anything for granted in football. Tony has been excellent for us and I hope he's here for many, many years to come." "I think he is the best central defender in the Conference. However, his form this season has not been as good as previous seasons and I wanted to give him a rest. " James may have been suffering from sleepless nights following the birth of his first child during the summer. "Those are decisions I have got to take from time to time. I expect he'll react positively to the disappointment and that's good. What we need is Tony back to his best," added Turner. James is recalled to the side today as Andy Tretton is ruled out with a hamstring injury. It's FA Cup time again and if Hereford United are to progress this year they have to defeat Radcliffe Borough this afternoon to kick-start this season's adventure. Although the Bulls start as favourites, Radcliffe will come to Edgar Street knowing that they have nothing to lose. They will be prepared to take chances and could give Hereford a run for their money. The Bulls need a win by several goals to lift the confidence in the squad and prepare them for the next two very difficult home games. That is assuming their is no replay of the Cup game which would take place in the middle of next week, thus meaning that the LDV game against Doncaster Rovers, currently arranged for Tuesday, would be postponed for a week. And with Conference League leaders Barnet at Edgar Street next Saturday, the Bulls face a difficult week. Fears have been expressed that today's attendance could fall below 2,000. If that happens it has to be hoped that the loyal supporters will still turn out in force and back the team to the hilt. Hereford United need to get this season back on track. A win today by several goals would help. Meanwhile the draw for the first round proper of the Cup takes place just after 5pm this afternoon. Goalkeeper Craig Mawson joined Latics just after the start of the 2004/2005 season on a short term contract. The former Halifax and Burnley 'keeper turned down a new contract at Morecambe to try for a return to league football and made his first appearance in the 2-0 defeat to Tranmere on September 14th as a substitute for the injured Les Pogliacomi.His first start came in the game against Doncaster Rovers. Manager Brian Talbot said at the time, "Mawson signed on Saturday for a month long contract and we'll have a look at him. Les Pogliacomi, (their usual goalkeeper - ed) by his standards is going through a difficult time and Craig's got to put him under pressure. He's got a month but he's never played at this level. He can't do more than he's done, he's played well in the reserves, he's trained well and I'll have another look at him on Wednesday against Manchester City." 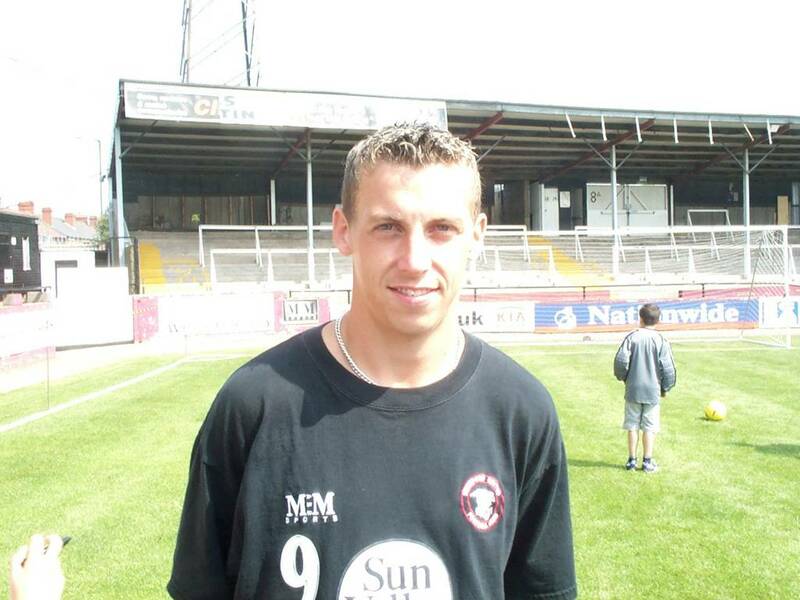 Before moving to Oldham, he played for Morecambe for three seasons from 2001/2 making 124 appearances. Before he was at Halifax where he played nine times. CRAIG 'Killer' MAWSON - from Keighley, DOB 16 May 1979, goalkeeper, signed for the club on the eve of the 2001-02 season. Began his career at Burnley, winning Pontins League honours along with, former Morecambe player,Phil Eastwood in the same side. Was understudy to Paul Crichton when the Turf Moor side won 1st Division promotion but with arrival of a new Greek international keeper Craig moved clubs. He joined Halifax Town for start of the 2000-01 season, was disappointed not to be give a contract after being 1st choice keeper in the later part of the season. He claimed the number one shirt and prove himself to be an excellent keeper with many an important saves. Craig was voted by supporters their Player of the Season for 2002-03 and some breath taking games. Also named for the England National Game team, sadly didn't play due to Conference managers saying the fixtures at the time were to congested to release players, however another call up can only be a matter of time. Craig Mawson has signed on a one month deal to ease the goalkeeping problems at Edgar Street reports ClubCall. The twenty five year old was contracted to Oldham but has agreed to join the Bulls for at least a month. Mawson was on the bench for Oldham last Saturday but was not offered a new deal early this week by manager Brian Talbot. Mawson has plenty of Conference experience, he spent three seasons with Morecambe as their first choice goalkeeper and was included in the English Semi Professional side on a number of occasions during that time. Graham Turner said that although Ben Scott currently has the first team shirt he will have to be on his toes if he wants to keep it now that he has competition. Mawson will be in the squad for the cup game tomorrow although he will not be starting. Rob Purdie will face a late fitness test before tomorrow's Cup game. He is reported to have a groin injury. Other than Purdie, Andy Tretton is the only other player sidelined for tomorrow. Meanwhile Graham Turner has spoken to the Evening News in advance of the Cup tie. "We don't know too much about Radcliffe. We looked to have them watched at Guiseley last week but the game was postponed. We will have to be careful because they will come here fancying their chances. "We can put to one side all the pressures of our league form and concentrate on getting a little cup run going. A win will give us confidence and it is something the players need. "We've sat down with the players and watched excerpts from the Carlisle game. We have not been defending right in certain circumstances and we need to get that addressed." Hereford United take a break from the league tomorrow afternoon when they play hosts to Radcliffe Borough in the F.A. Cup 4th qualifying round. The Cup fixture couldn't have come at a better time for United who are currently suffering from poor league form. Radcliffe are in the lower reaches of the Unibond Premier Division. Radcliffe will give late fitness tests to a number of players before their big game tomorrow. Steven Hill and Paul Challinor, who are both defenders, are doubts for the game. The experienced Karl Marginson also faces a late fitness test. Steven Spencer, a right sided player, will be missing as he is due to have a scan on his knee that will keep him out for a month. Paul McGuire is also out with a hamstring injury. Kevin Glendon, the Radcliffe manager, beleives that goalkeeper Danny Hurst is the one to watch in his side. He thinks that the 'keeper is good enough to be playing at a higher level. He is in his fifth season with them, and has been watched by Manchester City and Sheffield Wednesday amongst other league sides. Hereford are currently looking for a goalkeeper! Graham Turner is forced to make at least one change to his side. Andy Tretton has a hamstring injury therefore skipper Tony James will step in after being dropped for last weekends trip to Carlisle. "I think Tony realises that he has not played as well this season, for whatever reason, and I'm hoping that if he comes back on Saturday it will start to be the return of Tony James to what I think is the best central defender in the Conference," Turner commented to BBC H&W yesterday. Other than Tretton, Hereford are expected to have a full side to choose from, including Lee Mills who has recovered from a neck injury. Radcliffe, who will have quite a good following by their usual standards, will be looking forward to what is their "big day out", however they will not be expecting too much in terms of the result. Hereford must be careful and make sure that they do not become complacent. If they go about the game in the right manner they should have no problems getting the right result. Hereford United will welcome Radcliffe Borough to Edgar Street tomorrow. The visitors are travelling to Hereford today and will stay at one of the top hotels in the area tonight. The Lancashire side are said to be looking forward to the game and the chance to play against a top team from the Conference. They will be playing in their home strip which is blue shirts, blue shorts and white socks. Manager Kevin Glendon told Bulls News that he side will try to play good passing football. His team are not known for lumping the ball upto the forwards and neither does he expect them to try and use rough tactics.He mentioned that he thought the fitness of Hereford may contribute to the result as his team is part-time. "The F.A Cup is all about finance these days for clubs at our level and a good cup run is a boost to the club and in our case helps us with the many projects we have ongoing. What I do believe however is that our players should not be daunted by the fact of travelling to a conference side and in fact I am sure they will relish the experience and who knows what may happen, the pressure is all on them as everyone expects us to lose, so in that case we have nothing to lose," said Graydon. The Radcliffe manager knows both Richard O'Kelly and John Trewick, the past and present Hereford United coaches, and remarked on the seemingly different style of play adopted by the Bulls this season. He mentioned Adam Stansfield as a player he thought his side would have to mark closely. Bernard Manning, the president of the club, has a show in Cornwall on Saturday evening and won't be at Edgar Street but "you can be sure he'll be close to his phone whilst the game is taking place", said Glendon. He added in a jocular way that, had he been able to attend, Manning might have upset those Hereford United directors who are not broad-minded! Ratcliffe are expecting to bring around 250 fans to Edgar Street. Four coaches are booked and their following is expected to make a fair bit of noise. "I am also delighted for our supporters who will get the opportunity to travel to a top conference side and be involved in what will be a good atmosphere. I believe we have filled the first three and with many others travelling in cars, for a club of our size it is excellent support and shows just how far we have progressed, I hope they fully enjoy the day and regardless of what the result may be, that they saviour the experience and have a great time, in fact similar to what I will be saying to the lads (except the result part! )," commented Glendon. Andy Tretton will miss Saturday's cup game but Tony James is expected to return to the squad. More in Brian's preview of the game later. Rob Purdie has made the English National squad for next month's Under-23 friendly with Italy on November 10th. Craig Stanley who was named in the initial 30 strong squad misses out. Meanwhile ex Hereford United goalkeeper Matt Baker and his Wrexham colleagues were left in the dark today at the Racecourse after the electric was turned off. ITV Wales reported that someone paid off enough of the bill for the ground to be reconnected late this afternoon. Wrexham have huge financial problems. Better news from Northwich where their CVA has been agreed at 30p in the pound this afternoon. Jan Molby has left Kidderminster Harries. In a statement released this morning the Directors of Kidderminster Harriers Football Club have announced that director of football Jan Molby has resigned from his position with the club. Following a meeting between Molby and the Directors, Molby offered his resignation from his post which the Board, after much due consideration, have reluctantly accepted. Molby's decision brings to an end his second stint in charge of the club. Molby initially took over as manager in May 1999, leading Harriers to the Nationwide Conference in his first season in charge. Molby left Aggborough in March 2002 to take over the hot-seat at Hull City before returning in October last year as Ian Britton's replacement. The club needs a spark to re-ignite our season and Jan felt it would be best if someone else tried to do that. Molby's last game in charge was Tuesday night's 3-0 defeat at Chester City, a result that saw Harriers remain bottom of the Coca-Cola Football League Two. Chairman Colin Youngjohns admitted it was a tough decision for Molby but one he accepted was in the best interests of both parties. "Both Jan and ourselves are united in our disappointment at the league position the club currently finds itself in," Youngjohns said. "Results haven't gone the way we would have hoped and Jan's task has been made all the more difficult by the horrendous injury problems we have suffered. "The club needs a spark to re-ignite our season and Jan felt it would be best if someone else tried to do that. "It was a difficult decision for him but we respect and understand his rational for this course of action." The events at Kidderminster mean that they join Shrewsbury Town as managerless at present. Luckily no such problem is envisaged at Hereford United where manager Graham Turner is also chairman and largest single shareholder in the club. Hereford United has failed to watch Radcliffe Borough in action as the Lancashire team's game last weekend with Guiseley was called off. Graham Turner knows that cup upsets can happen and has warned his players to be absolutely spot-on in their attitude, determination and play on Saturday. "We can really look forward to this game although we realise it is a potential pitfall," Turner told the Hereford Times. Ten Thousand Pounds is the prize for the winners and, judging by the expenditure at Radcliffe recently, it looks as though Hereford United are more deserving than their opponents. Radcliffe are understood to be travelling to the Hereford area to stay overnight before the game. Bernard Manning, the president of Radcliffe Borough, is unlikely to see his team take on Hereford United in the FA Cup game on Saturday. Although he has supported the club for many years, his son Bernard junior is now the chairman. Manning senior told the Hereford Times that he is proud of his association with Radcliffe. "I've been involved for a good few years now, and it's a very go-ahead club. We've just spent more than £300,000 on a gymnasium and new dressing rooms. "There's a good social side,too,and we're all looking forward to playing Hereford. "I've been down that way and performed in Ross-on-Wye. I probably won't be at the game as Saurday's are always a big night for me with a big fee and contracts worked out a long way in advance." Herefordshire Council planners have received proposals from Vodafone for new equipment at the Edgar Street football ground, the home of Hereford United. According to the Hereford Times, the proposal is to install antennas and other radio equipment, housing for radio equipment and ancillary development. Orange already use the floodlights at the ground for some equipment and were known to be paying a rental of around £2,800 per annum to the football club. What is not known is whether any rental, if the proposals are approved, will go to the club or Formsole who lease the ground from the Council. Bulls look out for second keeper. Hereford United are looking for a second goalkeeper to keep Ben Scott on his toes. However Scott will keep his place in the squad on Saturday for the Cup tie against Radcliffe. "We cannot go through the season with just one keeper. And rather than having one first choice, you need two equal to each other, so they can put pressure on each other," Bulls coach John Trewick told the Hereford Journal. Trewick also spoke about the team's recent poor performances. "We're not a bad side, we're still sixth in the League. But these results have allowed a lot of other sides to draw alongside us. "We are only a third of the way through the season, and it's a case of addressing the reasons. We'll win sooner or later, I am certain of that." Hereford United have been drawn against Kington Town in the one semi-final of the Herefordshire Football Association Senior Challenge Cup. The game will be played at Edgar Street. The other match will be between the winners of tonight's tie, featuring Pegasus and Bromyard, and Westfields. The games have to be played on or before March 12th. Graham Turner, the Hereford United manager, may use the game as a means of getting any suspensions out of the way. Luckily the Challenge Cup counts as a game which can be used for suspensions. In the previous round Turner was able to use that game when both Andy Tretton and Graham Hyde were suspended. Turner may therefore leave the date of this Cup game in limbo until suspensions are affecting his squad. Is Richard O'Kelly the key to this seasons run of good form at Bournemouth. Bournemouth Football Club are currently fourth in Division One with some of the best statistics for scoring goals in that league. And last night their Carling Cup game against Cardiff City started late because of crowd congestion caused by a sell-out gate. The Cherries had defeated Blackburn in the previous round. Whether either of these facts can be put down to their assistant manager/coach Richard O'Kelly, who recently joined them after two years at Hereford United, is open to debate. Viewers of Sky Sports last evening saw O'Kelly commiserating with his squad after they were defeated in a penalty shoot out by Cardiff after both sides scored three goals. By all accounts it was a superbly entertaining match to watch which was described as a thilling and topsy-torvy game by one Bournemouth Site. A second site said it was another drama packed evening. "The Cherries started the game with an unchanged side and the benefits of consistency showed. This fired up the visitors a little but a neutral observer would have been hard pushed to tell which team played in a higher league than the other," said one report. Bournemouth have the best goal difference in the League One, plus 11, and have scored 29 goals in 15 league games. Hereford United were in much the same sort of position (as Bournemouth find themselves at present) twelve months ago, scoring goals and playing entertaining football. Maybe O'Kelly and Paul Parry who came on as a sub for Cardiff had a few words afterwards. They both must wonder why Hereford are, as yet, not performing quite as well as last season. Below are full details of the Radcliffe Borough squad. Several players could have played against Hereford United when with Conference clubs. Others have Football League experience. Danny is now in his 5th season with the Boro after signing from Cheadle Town in the summer of 2000. Danny has been recognised as one of the best keepers in non-league football and such recognition has ensured several league clubs have looked at him, notably Manchester City and Sheffield Wednesday. Signed from the Boro's youth team and reserve team. Played in a few pre-season friendlies while covering for the injured Danny Hurst and impressed everyone with a few decent saves. Steven joined us from Rochdale after being released along with Lee Duffy and Rory Patterson. Richard scored the winner in the Play-Off Final Penalty Shootout which got Boro into the Unibond Premier League, now in his 6th season still only 23 Richard has a bright future in the game and recently had trials with Crewe Alexander & Macclesfield Town. Lee joined from Rochdale in April 2004 and immediately became a fans favourite with his jinking runs down the wing. Best player of the season so far, but is suspended for the Hereford game. A winger from the Morecambe Academy with several first team appearances at Conference level to his name. Has got a sweet left foot. Vastly experienced defender who started his career with Sunderland where he made over 350 appearances and played in the 1992 FA Cup Final before moving to neighbours Bury in the summer of 1996. Currently sidelined with a broken arm. Simon is an excellent prospect who is in his 6th season at the club having graduated through the clubs youth team. A classy central defender/midfielder who is an ever present at the heart of the Boro team, he has attracted the attention of several league clubs and has ability to go far in the game. Has a good rapport with the fans. Former Morecambe Youth academy player who also had spells at Hyde United, Northwich Victoria, and Leigh RMI. Signed for The Boro in October 2004 and made his debut in the 3-0 win at Bamber Bridge. Karl is an experience non-league midfield player who is well respected in the non-league world and is a good passer of the ball, which suits the way the Boro play. Scored both goals in Barrows last day win at home to Boston utd to clinch a place in the conference for the bluebirds. Scott joined us for a second spell in July 2004 after he left to join Rossendale in May 2003 after gaining promotion with Boro to the UniBond Premier League. Former Rochdale and Altrincham midfielder who gives 110% commitment every game. Nicknamed Scholesey after his resemblance to Man Utd's Paul Scholes. He is a great character to have at the club and many Boro fans will be glad to have him back. Right Back/Midfield Player who we signed from Conference outfit Leigh RMI halfway through last season he is a former youth team captain at Sheffield United and looks set to have a bright future at Stainton Park. Signed from Dalians from the Lancashire & Cheshire league where he won all the honours every year and it was no exception when he joined the Boro. Picking up the Club Player Of The Year, Young Player Of The Year and Players Player Of The Year last season. Davey had an outstanding first season in non-league football, which was recognised by the intrest of Cambridge United and his hometown club Rochdale and was made captain half way through last season. A fans favourite who is better suited in midfield but played all of last season at centre back. Now in his second spell at the club. Simon left Radcliffe in 2000 for £5000, joining his ex Boro partner Paul Mullin at Accrington Stanley. Simon returned to Radcliffe on loan towards the end of the 2002-03 season before signing a permanent deal at the start of the current season. An attacking midfielder who always scores goals, scoring 22 goals in season 1999/2000 and 14 goals last season. 'Fozzie' Joined Radcliffe in December 2003 from neighbours Stalybridge Celtic. Signed for UniBond Premier side Hyde United during the 2001/02 season having previously been with Blackburn Rovers. A strong striker who made a big impact at Ewen Fields, despite ultimate relegation at the end of his second season with the club. It therefore came as little surprise when neighbours Stalybridge Celtic swooped to sign him in June 2003. Transferred to rivals Radcliffe Borough for a £2,000 fee in December 2003, which saw Chris Denham move the other way. A tough player who can score goals getting 11 goals last season and currently scored 6 in 8. Signed for Ashton United in the summer of 2001 from Bradford Park Avenue for a £2,500 fee. Previously with Bury, Bamber Bridge, Harrogate Town and Guiseley, his Robins career was delayed as he was representing Britain in the World Student Games in China. Speedy operator who runs a marathon every game and deservedly became a fans favourite by bagging 32 goals in his first season with the club. Continued to score goals on a regular basis for Ashton and then transferred to The Boro in May 2004. A former Northern Ireland U19 international who impressed Kevin Glendon in pre-season and instantly became a fans favourite who many have predicted to become the next Jody Banim. Signed from Rochdale and can play either Midfield or Upfront. He looks to have a promising future at Radcliffe and has the ability to progress ever further up the league. Sky Sports have announced that they are hoping to show a Sunday January 2nd Conference double-header (KOs 12.15pm & 2.15pm). At present Hereford United are due to play Exeter at Edgar Street on January 1st. Other fixtures on that date include local derbies between Barnet and Stevenage and between Carlisle and Morecambe. Jimmy Quinn, who has just finished as manager of Shrewsbury Town, is to take to the pitch again as a player. Now 45, he has signed for North West Counties League club Nantwich Town. The manager at Nantwich, Steve Davis, played at Northwich when Quinn managed the Conference side and was quick to give him the chance to put his boots on again. Quinn made two appearances for Hereford United in 2000, before moving to Northwich. Ratcliffe Borough come to Edgar Street next Saturday for their first ever fixture against Hereford United. The FA Cup fourth qualifying round tie should result in a win for the Bulls, but there are giant-killers in most rounds and Hereford will need to treat the opposition with a degree of caution. Radcliffe reached the first round proper of the Cup in 2000 and in the 2002/3 season were defeated by Chester City in the fourth qualifying round. The manager of Radcliffe Borough is Kevin Glendon, his assistant manager is Ronnie Evans, and Roy Davies is their physio. Now aged 43, Kevin Glendon is renowned as one of the best non-league managers in recent times. He is The Boro's longest serving and most successful manager winning the UniBond First Division Championship in 1997, FA Cup first round in 2000, and promotion again winning the UniBond play-offs in 2003. He is also the clubs Commercial Manager and as well as bringing in money to Stainton Park he has sold Niel Hardy, Paul Mullin, Jody Banim and Simon Carden for a total of £60,000. A player himself with Manchester City, Burnley and Crewe, he had a distinguished non-league career with Witton Albion, Mossley, Macclesfield Town, Northwich Victoria, Hyde United and Chorley and eventually The Boro. Assistant Manager Ronnie Evans is now in his 3rd season as Kevin's assistant manager. Was part of Joe Royle's backroom staff at Manchester City as their assistant physio. A former player himself with Manchester City and Bury he is also Sheffield Wednesday's assistant physio. Physio Roy Davies is a well-known and popular figure in the UniBond as he is at Stainton Park where he is very popular with the players and fans alike. Roy was Kevin's first physio and has been at the club for 10 years now. Popular with opposition fans as well he runs marathons every so often to raise money for charity. The Shropshire Star, not for the first time, has printed a story suggesting that Hereford United manager Graham Turner could be one of the candidates to take over the vacant manager's job at the Gay Meadow. The article, which lists nine potential candidates for the job, starts by saying that ex Bristol City manager Danny Wilson is a possible choice. "I am out of work at the moment so obviously I would consider anything but neither myself or my representatives have had any contact with Shrewsbury Town." Danny Wilson has become the latest high-profile name to be linked to the Shrewsbury job after Colin Lee and Bobby Gould both expressed an interest in succeeding Jimmy Quinn on Saturday. Stan Ternent, Mark Wright and the two Turners - Chris and Graham - have also continued to be linked to the vacant job over the weekend. Other candidates who may consider taking over at the Gay Meadow helm are former Town star Ross MacLaren and ex-England goalkeeper Peter Shilton. This is a report from Cambridge United on the under 18's game against Hereford played last Saturday. The Youth Team missed a number of opportunities, but still ran out comfortable winners against Hereford at Trinity Old Field on Saturday. The game got off to a good start, with the U's looking the stronger side and creating many opportunities. The hard work paid off when Stephen Smith pinged an inch perfect ball, from just inside the U's half, to Ashley Fuller (right) who calmly slotted it into the net. United always looked the stronger side, but Hereford had a couple of missed opportunities, which could have let them back into the game. The second half continued in the same fashion with United looking the stronger side. But with Hereford pushing hard for the equaliser some good play Darren Quinton broke the line of defence and whipped the ball into the box for a Hereford defender to score an own goal. The visitors were now on the back foot and in their desperate fight to score a goal opened themselves up and allowed Darren Quinton to slide the ball into the path of Sam Reed to coolly dribble around the keeper and place into the empty net for the third goal. United's fourth goal came minutes before the end of play, when Dave Daniels performed some tidy footwork and passed the ball to under 16 player Russell Short, who crossed the ball into the front post for Sam Reed, running across the defence, to score his second goal of the match. For Cambridge United this was a well-deserved win, despite missing a number of opportunities. Most leading bookmakers have increased the odds on Hereford United winning the Conference title. Recently Hereford were available at around 5-1, but the average price has gone out to 9-1 in the last few days. The best price for a Bulls title appears to be 10-1 which is on offer at Ladbrooks. Barnet and Carlisle have become joint favourites to win the title with an average price of around 7-4. Best price for Carlisle is 9-4 at Stan James, and for Barnet 2-1 both at Coral and Stan James. At the other end of the table odds of 5000-1 are offered against Northwich,Forest Green and Leigh RMI winning the Conference title. Meanwhile Hereford United's under 18 team were defeated 4-0 by Cambridge on Saturday in a league game. Carlisle have most banning orders. Carlisle United have more banning orders against their so-called supporters than all the other Conference clubs put together. Statictics released by the Home Office yesterday show that up to October 18th this year, Carlisle have 42 banning orders. Hereford United are shown to have 14, most of which came from the trouble that occured at Burton last September. York have eight orders, Exeter have five and Aldershot three. Both Tamworth and Canvey Island have one order each. Of non-league sides, Telford have nine orders against "supporters". Sportingbet set to double in size. Sportingbet, founded by Hereford United supporter Mark Blandford in 1998, is in talks to acquire Paradisepoker, an online poker firm. Blandford's company has a market value of around £229m and is said to be offering about £170m for Tropical Paradise, who operate the Paradisepoker website from Costa Rica. Sportingbet was recently named the world's leading online gambling operator by the industry bible eGaming Review. This puts it ahead of both William Hill and Ladbrooks. Blandford is often seen at Hereford United games and is thought to be a possible future chairman of the club. Meanwhile last weeks Hereford Times carried an advertisement for an experienced full/part time Groundsperson for Hereford United Football Club. Anyone interested please telephone 01432 276666. Graham Turner declined to be interviwed after yesterday's game at Carlisle and BBC Hereford and Worcester were not able to have an interview with a player, so, as yet there are no comments to report. Possibly Turner thought that it would be better to get the squad back to Hereford as quickly as possible. In fairness, it's a long way to Carlisle as those, out of the 300 or so supporters at Brunton Park, who travelled both ways yesterday found out. The Carlisle manager, Paul Simpson, was said to be impressed by the Bulls passing moves. "Today, Hereford proved to be a good side and they will be up there at the end of the season," Simpson told the Non-League Paper. "We were delighted to be leading at half-time and were possibly a bit fortunate to go into the dressing room ahead." The Cumbrians are back on track after defeating Hereford 3-1 at Brunton Park this afternoon. The game swung dramatically near half-time when Magno Vieira struck two goals inside a minute. Early in the second half he was involved again as Peter Murphy finished off another move to establish a two-goal lead that the visitors couldn't do anything about. Although both Andy Preece and Brian Shelley were available again, Paul Simpson left them on the bench and stayed loyal to Brendan McGill and Lee Andrews, whose places were most under threat. Instead he had to make an enforced switch at the back after Tom Cowan went down with flu on the morning of the match. Paul Arnison came in to replace him. It was the home team who did the majority of the early pressing, without much in the way of end product. A ball in by Peter Murphy from the left was dummied by McGill and almost brought an opening but the Bulls defence scrambled clear. A long range effort by Arnison never threatened stand-in Hereford keeper Ben Scott and a few moments later an even poorer effort by Karl Hawley trickled wide as the home side lacked the killer instinct in front of goal. Kevin Gray rose at the far post but his header from a Murphy cross lacked power and floated over the top. Hereford had barely threatened Matty Glennon in the home goal but on 20 minutes they struck gold. Arnison made an error from the left-back berth and a shot from David Brown was only parried by Glennon to Adam Stansfield who bagged his eighth goal of the season with a header from eight yards out. It was a wake-up call to the Cumbrians and their play was looking disjointed as the visitors began to get a grip in midfield. Brown fired in a shot from distance on the half-hour which brought a solid save by Glennon. The home crowd of 6,722 needed a lift badly and they got it with five minutes of the half remaining. Murphy put in a fine cross from the left edge of the pitch and Vieira rose at the far post to head home off a defender and level things up. The game had barely re-started when the boy from Brazil was in the thick of the action again. He collected the ball forty yards out and ran at goal before delivering a deflected shot that spun away from the stranded Scott into the far corner and put the home side ahead. The game was turned on its head with Carlisle ahead despite having not played particularly well. It was a much more confident United side who ran in at half-time and the second half began in a similar vein. Within a minute of the re-start they extended their lead. McGill put in a cross that Vieira got a touch on before the ball ran across goal to Murphy who drilled home from close range, notching up his third goal of the season. The game was far from won, but Carlisle now had clear breathing space. Hereford continued to pass it around and give United some problems. Brown shot over the top of the bar on 53 minutes. Defender Tamira Mkandawire headed well wide from the middle of the box as Carlisle played a containing game, looking to break rapidly through McGill and Murphy and utilise the explosive pace of Vieira. Stansfield's low shot brought a parry from Glennon and a corner. From the kick Craig Stanley rose well but headed well wide. Hawley was replaced by Craig Farrell as Paul Simpson sought to cement the victory. Lee Andrews, who came into his own in the second half, made a strong break from the back on 68 minutes and managed a shot that was blocked by Andrew Tretton, the ball spinning away for a corner. The defender managed another good cross, the ball cleared by Mkandawire. Soon after this Preece came on to replace Vieira who received a standing ovation. The popular striker was soon in the action turning sharply and firing a yard wide with his favoured left foot. Skipper Kevin Gray paid the price for some niggling fouls when he was booked on 76 minutes after upending the impressive Stansfield. Farrell put in wicked left foot cross that almost deceived rookie keeper Scott, who had to hook it with his foot as Preece lurked in the box. Simon Grand blocked a Brown effort as the game entered the closing stages but the visitors still played some decent football and refused to lie down. With Shelley on for man of the match Murphy, Carlisle couldn't dominate possession as they would have liked. Preece turned and shot well wide with his less trusty right foot as the game entered stoppage time. Robert Purdie brought the final save of the match out of Glennon with a 25-yard effort. Al's verdict: A valuable three points to get us back on track quickly after the setback of last week. This was in many ways a less impressive display than against Barnet, but this time we took our chances when it mattered. Vieira celebrated his loan extension with two crucial goals, even though there was a hint of luck about the second one. Murphy, getting another important goal to put the game away early in the second half, was a deserved man of the match for his close control and running. For all that Hereford looked a good side, with good appreciation of space and some solid defending on the edge of their box. In the end they couldn't quite contain Magno and with three goals so quickly, they were never likely to pull it back, especially with a series of speculative shots that Glennon coped with well. The FA Cup is next, and hopefully we can keep some of our newest supporters after another good crowd today. Two deflected goals by Magno Silva Viera gave a huge helping hand to Carlisle United as they defeated Hereford United 3-1 at Brunton Park this afternoon. An own goal by Lee Andrews had handed the Bulls a first half lead but early in the second Peter Murphy gave Carlisle the victory. Hereford made numerous changes to the squad that drew with Woking last weekend. Captain Tony James didn't travel, as previously rumoured and Lee Mills was also absent. Ben Scott made his first start in the Conference in goal and Tamika Mkandawire returned in place of James after a three match ban. Jamie Pitman recovered from a back injury and debutised for Graham Hyde and Mark Robinson was preffered to Danny Williams. Karl Lewis was the sub goalkeeper. Brown had the first chance of the game after two minutes when Hereford signalled their intentions. Adam Stansfield collected the ball after a good Hereford move and layed on for Brown whose twenty yard shot was saved well by Matt Glennon. Soon after at the other end Chris Billy had a shot over the bar after a scramble in the box. Murphy then forced Scott into his first save of the game, diving low to his right. Captain Kevin Gray had a good header just over the bar following a cross from Chris Lumsdon minutes before United took the lead. David Brown did well to break into the area and his shot was well saved by Glennon, but the ball fell to Adam Stansfield whose shot hit Andrews and found its way into the back of the net. Captain Andy Tretton got a touch on Pitman's free kick and triggered a scramble in the Carlisle box before Pitman's shot was blocked and cleared. Brown went close again with a shot from the edge of the box that Glennon gathered at the second attempt. Ryan Green overlapped well and latched onto Brown's through ball into the area, but Glennon again saved well to deny Green. Then, four minutes before half time, disater struck for the Bulls. Murphy supplied another dangerous cross and Viera met the ball with his head and it deflected off Tretton and beyond the reach of Scott. A minute later a freak goal handed Carlisle the lead. Viera hammered a thirty yard effort towards goal and it took a wicked deflection off Mkandawire that wrong footed Scott and found the bottom corner. Hereford would have found it hard to beleive they were behind at the interval, having easily matched their hosts. Two minutes into the second period the Whites found themselves further behind again as their opponents rampaged. A break down the right resulted in a cross that went all the way across goal and found Brendan McGill on the edge of the box and he made no mistake in finding the back of the net for 3-1. Hereford tried to break down Carlisle, they had plenty of possesion but the Cumbrian side were too solid and organised at the back for the Bulls get through. Williams replaced Green and Simon Travis moved to right back to accomodate the sub. Hereford did get some oppotunities, but Carlisle coped with everything that United tried. Man of the Match Mkandawire headed Pitman's free kick over and Stansfield had an effort from outside of the box saved. Mkandawire blocked Andrews twenty five yard drive before Travis crossed for Brown, who looked as if he was being held back but the referee gave a free kick the other way. The 6,400 or so home fans in a crowd of 6,772 thought their side should have had a penatly when Tretton appeared to handball and then moments later the away fans thought the same after a blantant push on Stansfield. Second half sub Andy Preece went close from twenty yards as Carlisle searched for a fourth. Brown got a lucky break off a defender following a right wing cross by Williams, but he was denied by a good saving challenge by Gray late on. The result may be a little harsh on Hereford who really didn't play too badly and seemed to enjoy a lot of the possesion. The two deflected goals in quick succession were pure bad luck ; had Hereford gone in at the break in the lead, as they deserved, then the game could have been totally different. Hereford need all of their players back to full fitness for the game in two weeks against top of the table Barnet in order to change their form around. The Bulls have collected a measly two points from a possible fifthteen. A break in the F.A. Cup against Radcliffe Borough couldn't have come at a better time for Graham Turner's side. They should look to use this game to try and restore some much neeeded confidence in the team. HUFC Team:(4-4-2) Scott, Green, Tretton, Mkandawire, Robinson, Travis, Pitman, Stanley, Purdie, Brown, Stansfield. Subs: Smith, Hyde, Lewis, Williams, Carey-Bertram. CUFC Team : Glennon, Andrews, Gray, Grand, Annison, McGill, Lumsdon, Billy, Murphy, Hawley, Viera. Subs: Shelley, Farrel, Preece, McDonagh, Westwood. David Brown, the Hereford United striker, says that the Bulls are going to Carlisle for a win but he isn't sure whether today's game is the most important of the season. "It's too early to say. We've had a bad run in our last four games and not started the season as well as we hoped for," Brown told the Evening News. "It is a big deal (to us) because we are not winning at the moment and not getting the results we want. "There are high expectations and fans want to see what they saw last year. But this year, teams know what we are all about. We battered a lot of teams last year but now they are shutting up shop and it's a bit harder. "From our own point of view, we should have won more games. It's not like us to give away a two-goal lead which we did against Woking. "And we conceded a late goal at Accrington which cost us. Everyone who watched us that night knew we should have won. Perhaps we are not getting that luck that we've had in previous seasons. "We are finding it hard to keep a clean sheet right now and, obviously, the emphasis has been on defending to try and get things right. The lads are still confident and we are not going to let this run affect us. "We are going for a win at Carlisle. It's probably the ideal place to go to because they will come out at us and we will look to get at them on the counter attack." As at 8am this morning the game at Carlisle is on. During the past 24 hours they have escaped most of the rain and today's forecast for the area doesn't give much rain until towards the end of the game. For those unable to go to Brunton Park, it is understood that BBC Radio Cumbria may be covering the game on the internet. The Directors of Shrewsbury Town Football Club and its Manager Jimmy Quinn have today announced Jimmy's decision to resign as manager for the club. Following a meeting with the Directors yesterday afternoon Jimmy Quinn indicated that "It was a difficult decision for me to make particularly after the success of last season but I had to put the interests of the club and its supporters first and felt that now was the right time to bring a fresh approach into the club." Chairman Roland Wycherley said "It is with tremendous regret that we are parting company with Jimmy but unfortunately he was adamant that the time was right for a change. Whilst the board were obviously concerned about the current league position we will be forever indebted to Jimmy for gaining us promotion back into the league last season, and wish him every success for the future." Chic Bates has been invited by the Chairman to take charge of Saturday's game. Both parties have agreed that no further statement will be made. Hereford United travel to Brunton Park, Carlisle tomorrow for the first game between the two clubs since March 1997 when the Bulls won 3-2. Since then Hereford have been in the Conference and Carlisle joined them at the end of last season. So far this season Carlisle have had the better start. Although drawing many of their matches, they have lost just once in their last six home games, winning four and drawing the other one. The goals for column just outweighs the goals against over this period, 8 to 6. On the other hand Hereford were going well away from home until two recents defeats at Dagenham and Accrington.The Bulls have picked up four victories from the last six with a decent return of 15 goals for the Bulls, and 6 goals against. Hereford United will give Ben Scott his first Conference start in goal as Jonathan Gould has returned to Preston. Scott who moved to Hereford from Sheffield United at the beginning of last season, played in several pre-season matches and Graham Turner, the Hereford United manager seems confident that he can fit into the squad. "Certainly in training he looks a very confident keeper, makes outstanding saves. We've had a chat about it and decided to give Ben a chance. "Our goalkeeping coach, John Trewick, and myself all feel that Ben has the atributes to handle the situation like Carlisle," Turner told BBC Hereford and Worcester. Otherwise Turner has no fresh injury worries, although there is some doubt as to whether he will start Jamie Pitman who hasn't had a game since injuring his back in the game against Aldershot. He may also feel he needs to go with as strong a defence as possible so as to try and keep the pressure off Ben Scott. Rumours that Tony James, the Hereford United captain, may be dropped are not confirmed. James, like many other players during their careers, has had a few games recently where he has not looked at his best, but as Graham Turner often says no-one becomes a bad player overnight. As for Carlisle they are expected to have Andy Preece back to partner Karl Hawley upfront. Full back Brian Shelly is also poised to return. Both Preece and Shelly played in a reserve game against Chester on Tuesday and proved their fitness. Preece will be a player to watch as he scored four goals in early season before missing nine games with an ankle problem. Manager Paul Simpson is not expected to play as he has a long-term knee problem. This will be a crucial game for both sides. Carlisle will wish to get back to winning ways after defeat by Barnet, and Hereford will want to prove that they are still in contention for a top place in the league after a poor run of results this month. Ben Scott will get his chance to show how he's progressed on Saturday against Carlisle says Graham Turner, the Hereford United manager. Turner admits that the circumstances are not ideal but rather than try and find another keeper at short notice, he has decided to give Scott a chance. "He's been with us now for fifteen or sixteen months. It's an opportunity for him to come in and show he's good enough," Turner told BBC Hereford and Worcester. "I think he has waited patiently. He's worked tremendously hard and it's now up to him. "It's a blow losing someone of the calibre and experience of Jonathan Gould." The Preston manager, Billy Davies, has told his official website about the recall of Jonathan Gould. His first choice keeper Andy Lonergan could be out for up to six months. "I've decided to recall Jonathan Gould," said Billy Davies this morning. "The situation is now very clear that we have two very experienced goalkeepers. "Wardy will be the number one keeper, because he's got the jersey at the moment, but between Wardy, Gouldy and young Chris Neal it's a case of who's playing well, who's doing the job and we'll select the one doing that. "I think all players know that competition is part of the game and it will be no surprise to Gouldy, he's had it before, he knows situation and it's just a matter of doing it in training and biding his time until he gets a chance to come into the team. I'm sure he'll be looking forward to coming back and looking forward to the opportunity when it came along. "Hereford were looking at making his move premanent, but there are always twists and turns in football and there's a door opening here and Gouldy will come back and wait his time until he gets an opportunity." Graham Turner fears that Carlisle will want to get back to winning ways on Saturday after their mauling by Barnet last week. "There is always the fear that Carlisle will take things out on us after losing to Barnet. That result ended their unbeaten start and they will want to put it behind as soon as possible," the Hereford United manager told the Carlisle News and Star. "Carlisle are a good side and have adjusted to life in the Conference very quickly. They have produced a number of impressive performances already this season and they will want to put in another against us. "Although our form has been disappointing during the past four games, I'm always optimistic and hopefully we can turn it around in this game. "We couldn't have asked for a tougher fixture but there will be a decent crowd and I'm hoping our experienced pros will relish that. "I beleive that big crowds help the good players and bring the best out of them and I'd like to think our key players will do the business." Lee Mills, the Bulls striker, will meet up with Paul Simpson, the Carlisle manager, again on Saturday. They played together at Derby in the mid-nineties. BBC Hereford and Worcester are reporting that Graham Turner is to let Ben Scott have his first Conference start against Carlisle on Saturday. This report contradicts Jonathan Gould's answer on Sky Sports last night when the goalie said he was playing for Hereford United this weekend before returning to Preston. Turner is understood to have ruled out bringing a replacement goalkeeper to Edgar Street before the Carlisle game. Although the article was written before Johnathan Gould told Sky Sports of his return to Preston next Monday, the Hereford Times has revealed that Gould would not be able to take part in the FA Cup game against Radcliffe Borough. Graham Turner may give Ben Scott a chance in the Cup game, or else he will need to find another goalkeeper and get him familiar with the squad in time for, at the latest, the home game against current Conference leaders Barnet in two weeks time. This all assumes that no deal can be done with Preston to bring Gould back to Edgar Street. It would have to be a permanent agreement as Preston can not loan Gould out again to Hereford United. This morning it looks increasingly likely that Jonathan Gould has played his last game at Edgar Street. Jonathan Gould has just said on Sky Sports that he is going back to Preston on Monday. He confirmed that he is to play for Hereford United on Saturday. Gould was speaking at the end of a Football Special. Earlier Sky Sports had invited him to join the panel reporting on the European games this evening. Gould gave his views on the Celtic game and appeared to be doing a very professional job. The programme was presented by Jeff Sterling. Although his position at Edgar Street remains uncertain, (he only said he was returning to Preston on Monday - no mention of whether that was temporary or permanent) he may be hoping that media work could make up his income should he move to Hereford on a more permanent basis. After last Saturday's home defeat by Barnet, Paul Simpson, the Carlisle manager, told his fans that he thinks that it is important for his team to bounce back this Saturday against Hereford United. "It makes the Hereford game an important one for us and it's another great game to look forward to. "It's another game where football will be played for the fans to look forward to and it's up to us to get on to another unbeaten run." Meanwhile Carlisle striker Karl Hawley has been put in the initial squad of 30 to play Italy next month. 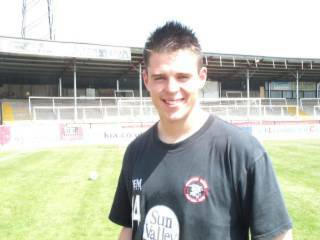 Hawley spent time at Edgar Street on loan from Walsall in early 2003. He played six games and scored once for the Bulls. He may be partnered on Saturday by veteran Andy Preece who has been sidelined with injury. Preece played in a reserve game with Chester this afternoon at the Deva Stadium which Chester won 4-0. Finally, as Bulls News reported yesterday, seats for Hereford United fans are available in the Platium Suite on Saturday, but the area is not segregated. No decision on Gould yet. It is still unclear whether Jonathan Gould will be required back at Preston before his loan spell with Hereford United ends. As reported last night there is a goalkeeper injury crisis at PNE with Andrew Lonegan breaking two bones in his hand. Billy Davies, the Preston manager, is reported to be looking at various options including a recall of Gould. "Bringing Gouldy back is an option, we will have to look at the situation, but we will need to bring some cover in before the weekend." Bernard Manning Junior is the the chairman of Radcliffe Borough, his dad Bernard Manning Snr (the Comedian) is the president. Bulls News apologies to Radcliffe Borough for calling Bernard Manning Snr chairman in our article last Monday. It may have no effect on Jonathan Gould's loan spell at Edgar Street but Preston North End's goalkeeper Andy Lonergan injured his hand in the game against Queens Park Rangers this evening. It has since emerged that Lonergan has a suspected broken index finger and according to the official PNE website the injury is expected to keep him out of action for some time. "Andy's injury is a major blow and I am going to have to look at the situation," said Manager Billy Davies. Gavin Ward is usually the other goalkeeper in the PNE squad and replaced Lonergan after his injury. Gould is on loan at Hereford until the second week in November but could be recalled if need be. Meanwhile Steve Guinan regained his touch this evening scoring once for Cheltenham. It is understood that Carlisle United will allow Hereford United fans to sit at Brunton Park next Saturday, but is the area is unlikely to be segregated. There is plenty of room for fans who don't mind being on the terraces but it is open to the elements. Recently because of large attendances Carlisle have found trying to segregate fans who want a seat very difficult mainly because they don't know how many away fans will travel and don't wish to keep out any home supporters. So the message seems to be that if any Hereford fans want a seat please give Carlisle a ring on 01228526237. Meanwhile Hereford United's under 18's lost 4-2 at home to Mangotsfield United in the FA Youth Cup second qualifying round last night. Hereford United are the best disciplined team in the Conference so far this season according to the Non-League Paper. However Carlisle are close behind in second place. The top two play each other at Carlisle on Saturday and already the Carlisle News and Star has got its facts incorrect. They report that Paul Simpson, the Carlisle manager, has transformed his side from sinners to saints by tightening up their atrocious discipline last season and making them the best behaved team in the Conference. At present Carlisle have received 13 yellow cards, whilst Hereford have 11 yellows and 1 red. Using three points for a yellow and five for a red, Hereford have 38 points and Carlisle 39 points. "Our discipline has been excellent and I think that has been very important this season," said Simpson. "It needed to be sorted out because it was atrocious last season. It did concern me because at the start of last season we had one of the worst records. "You normally find that teams at the bottom of the league have dreadful disciplinary records. "The players need to keep their heads and that is something we talk about all the time in training. The best way to get back into games is to keep our heads and keep our shape. "We have a discipline structure which we stick to and, if players break the rules, they get fined for it. They probably don?t think about that on the pitch but we try to instil it into them to keep calm and keep their heads. "If you lose concentration in a game by bad-mouthing the referee or belting a player, it stops you doing your job." In contrast to Hereford United, who received just one yellow card given to Jonathan Gould last Saturday, Carlisle received three. Peter Murphy, Chris Billy and Chris Lumsdon were all booked in the top of the table clash with Barnet. Hereford United's under 18's are in action tonight at Edgar Street. They take on Mangotsfield United in the second preliminary round of the FA Youth Cup kick-off at 7.30pm. Meanwhile Forest Green Rovers are expected to give a trial to striker Michael Husbands this week. Husbands is currently at Southend, but spent time on loan at Edgar Street when at Aston Villa. Radcliffe Borough isn't a name familiar to many Hereford United supporters but most of them will have heard of their chairman. Bernard Manning, who came to fame in the seventies on the Comedians television programme, currently fills the post. He and his team have brought Radcliffe into the 21st century. Here are a few edited notes about the Lancashire club from their website. The Club was formed on the 24th April 1949 and became members of the South East Lancashire Football League. After a short period in that league, they moved on to the Manchester League before gaining access to the Lancashire Football Combination in 1963. In 1972, success came, winning the League Cup and finishing third in the league. Two years later, the Club applied, and were accepted into, the Cheshire League, which subsequently became the North West Counties Football League The first season again brought success, when Radcliffe secured the Second Division championship, in front of a record, Stainton Crowd of 1,468. After one season in the first Division, they lifted the First Division championship and then made the step up into the newly formed, Northern Premier League, now the Unibond League. In season 1996/1997 manager Kevin Glendon, who has been at the club for fifteen years, and the Boro team achieved its highest honour, in winning the Unibond First Division title by 2 points ahead of local rivals Leigh RMI. Unfortunately, their stay in the `top flight' lasted only one season. One notable player who came from Ratcliffe was former Shrewsbury striker Jody Banin. He scored 46 goals for the club in 2002-2003 which was a great year for Boro, who had a fantastic run in the FA Cup when they reached the 4th Qualifying round but lost to Conference giants (at the time - ed) Chester City. With Boro back in the UniBond Premier Division and a place in the newly formed Conference North League up for grabs, in which they had to finish in the top 13, that was obviously the aim. By November Boro were as high as sixth thanks to the 22 goals of Jody Banim who set an English record by scoring in 14 concecutive games. Boro sold Banim to Conference promotion chasers Shrewsbury Town for a record fee of £20,000 in December 2003, and without his goals they slid down the table eventually finishing 19th and into the play-offs beating Whitby Town on pens 8-7 in the quarter finals, before bowing out to Burscough in the semi finals at home. Under the hard work and guidance of Chairman Bernard Manning, Glendon and the board of directors Boro have gone from strength to strength. Off the field they are widely recognised as having made more progress than many other non-league clubs. With the help of grants from the Football Association, Football Foundation, Lottery Sports Fund, Club Funds and personal investments, Radcliffe have so far been able to provide the following: Floodlit all weather pitches, Upgrade the terracing, New car park, Purchase the Social Club & Refurbish the building. Build a New Sponsors Lounge, Changing Room Block, A new 350-seated stand and six brand new Nationwide Conference Standard floodlights. These along with many more, smaller projects, show you why the Club's reputation has grown and Radcliffe now have one of the best non-league grounds at their level. Hereford United have been drawn at home to Radcliffe Borough in the fourth qualifying round of the FA Cup. The tie will take place on Saturday October 30th. The winner of each tie receives £10,000. Radcliffe Borough play in the Unibond Premier and currently lie in sixteenth position. The following letter appeared in today's Non-League Paper. We attended The Rec on two occasions last season as Hereford United fans, once in the league and then in the first leg of the play-off. On both visits we were met with unhelpful and arrogant stewards, and videoed and watched by little Hitlers in their riot gear who unsuccessfully tried to antagonise and taunt us away fans. When Aldershot Town FC has better arrangements for away fans, perhaps all the agression and frustation will cease. It is certainly not a very pleasant ground to enjoy football when you are bombarded with coins, missiles and verbal abuse from home fans that stand metres away on the same terrace. After the game we were kept in the ground for thirty minutes so the home fans could get away, upon our exit they were still hanging around the away coaches, surely it makes sense to clear the travelling fans out of the town and away first! We travel many miles watching our team and every ground we've been to we have been made very welcome and everyone is friendly. Come on Aldershot Town, sort out your local police force and make your club a friendly place to come to - and then the hooligan element may stop. Debbie and Dave Lewis, Hereford. Former Hereford United captain, Ian Wright, is close to ending his playing career. He moved to Burton after being released by Graham Turner a year last spring. Current Bulls captain, Tony James, revealed the news in his column in Bullseye yesterday. Wright was at Edgar Street for the recent Burton match and told James that he was having a lot of trouble with an ankle injury which has succumbed to general wear and tear over the years. Now part-time, Wright is also working in the building trade. But he hasn't decided yet whether he wants to continue in the game on the coaching/management side. Graham Turner, the Hereford United manager, told the Non-League paper that his team went to sleep after half-time in yesterday's game against Woking. "It's two points thrown away and it's frustrating time at the moment. We can't seem to keep a clean sheet and from totally dominating the first half we went to sleep for the first 10 minutes of the second and it proved to be costly. "We should not be conceding goals like we did today. That's what we are working on and will continue to work on, but i thought there was a lot of effort, a lot of good play at times. "Generally the first half was very good and every time we got the ball in their box it looked as though we might finish with a strike on goal. But when you concede goals like we did it puts everybody on edge. "Players who had done well in the first half are suddenly very edgy, the confidence goes a bit and the play doesn't flow." The players were said to be none too happy after this afternoon's drawn game with Woking. "The boys are disappointed. We've thrown it away. It's our own fault," commented Simon Travis on BBC Hereford and Worcester. "It was a great start and it was there for us to build on. I thought we dominated the first half getting the second goal just before half-time. "But at the start of the second-half we just did not come out. In the first ten minutes we went to the races. Talking about the Woking goals, Travis thought that the first was a good goal. "It got them back into the game and the equaliser has cost us two points." Meanwhile Hereford United under 18's were defeated 3-0 this morning by Luton Town. Jonathan Gould set no example to the rest of his team when conforting the referee this afternoon over one of his decisions. The incident in question was late in the game when Craig Stanley looked to be brought down just inside the area by a Woking defender. The linesman appeared to signal a penalty but referee Mr A Hendley turned down the claim and awarded a free kick inches outside the area. Several Hereford player protested to the referee and suggested he might talk to the linesman which he refused to do. It was during the protest that Jonathan Gould ran all the way from his goal to add his feelings to the protest. Gould looked to be very angry but he went too far and was shown a yellow card. Whatever the rights and wrongs of the incident, the referee had made his decision and Gould's protest was well over the top. It is the second time Gould has been booked for dissent. He was booked in the game against Burton Albion when Tamika Mkandawire was sent off. His behaviour was no example to the rest of the team. Talking to BBC Hereford and Worcester after the game, Simon Travis was asked about the incident. "Gould was frustrated. The linesman put the flag across his chest. He was in the best possible position. He's given a penalty. I couldn't understand why the referee said no to it." Hereford United will feel very disappointed in the manner that they let a two goal lead slip in the eary stages of the second half at Edgar Street this afternoon. Woking will be the happier of the two teams with the draw considering the half time score. Hereford's only change from the team that started at Accrington last Monday was in the attack. Adam Stansfield was handed a start in place of Lee Mills. Tom Smith was absent from the bench with a stomach bug. United got off to the best start possible when they took the lead quicker than they lost it on Monday Night. Danny Williams found the back of the net after good work by Rob Purdie on the left after just thirty eight seconds. The Bulls continued to play good football afer their brilliant start and Stansfield was just inches away from converting Ryan Green's right wing cross. Stansfield was presented with another glorious chance when Green switched play to the left and Purdie passed into Stansfield, who yet again was inches away from the ball when unmarked. Green again switched play minutes after to Brown as United continued to pressure Woking. Brown found Purdie who saw his shot tipped onto the foot of the post by Shwan Jalal in the Card's goal. Stanley went close from the resulting corner with a half volley that flew just wide. Andy Tretton was dispossed in his own area by Raphael Nade, who shot just wide, with Woking's best chance of the half and just after Brown had a shot straight at the goalie, Woking swung in a dangerous free kick that just evaded the head of Justin Richards at the far post. Ten minutes before half time Stansfield doubled the Bull's advantage. The attacker won a free kick on the left that man of the match Purdie crossed in. The ball found it's way back to Purdie who crossed for a second time. Jalal missed the ball and it hit Stansfield on the shins and rolled into an unguarded net. Woking's manager, Glenn Cockerill then made what turned out to be an inspired tactical sub. He subbed striker Amos Foyewa on for midfielder Scott Canham to form a three man attack. Still Woking didn't create anything in the first half and Andy Tretton went very close when he blasted his close range effort over. The start of the second half proved very costly for United. They switched off for the first ten minutes and after fifty three minutes they found themselves on level terms again. Woking's first, after fifty minutes, saw Ian Selley find Richards with a through ball and he did well to turn and fire beyond the reach of Johnathan Gould. Just three minutes later Karl Murray's left wing cross find the far bottom corner with the possibility of a deflection off Green. Hereford still didn't create anything clear cut until much later in the half but Woking also created little. Graham Hyde was tackled deep inside his own half and the ball eventually found its way to Nade who shot over from the edge of the box. Mills was introduced for Williams in a tactial sub that saw United switch to a 4-3-3 formation. Purdie made a brilliant run from the wing into the box, but the ball was smothered by the 'keeper in a spell of three minutes that saw plenty of opportunties for the Bulls. Brown cut in from the right and fired a shot from ten yards at Jalal before Stansfield headed just wide from Travis' cross. Richard's was denied by an awesome save by Gould in a rare Woking attack. Richard's headed goalwards at the far post after a brilliant right wing cross, but somehow Gould managed to keep it out. Craig Stanley was then denied a cast iron penatly by the referee at the other end. He skinned Jon Boardman who the clipped the heels of Stanley inside the penalty area. The linesman, who was no more than ten yards away flagged, and then placed his flag across his chest to signify a penalty. Referee, Mr A. Hendley, ignored his assistant and gave a free kick outside of the box. The dangerous Richards had another good chance on the break but shot wide of the far post from the right of the area. Mills flicked on for Stansfield soon after, but Stansfield was denied by a crucial touch by Jalal when he was through on goal in United's last real chance of the game. The draw sees United's home run without a defeat extend to five games, but Hereford have now gone four games without victory. Yet again, it is evident that a lack of concentration in the defence let the Bulls down. It seemed that they had the game in total control at half time after a very good first half performance, but the ten minutes after half time proved very important. If Hereford can correct the few problems that they seem to be experiencing then a return to form is not too far away. The football played, in general, was good today. HUFC Team: Gould, Green, Tretton, James, Travis, Purdie, Hyde, Stanley, D. Williams, Brown, Stansfield. Subs: Robinson, Scott, A Williams, Mills, Carey-Bertram. WFC Team: Jalal, Murray, Boardman, McDonald, Oliver, Jackson, Selley, Canham, Evans, Richards, Nade. Subs: Smith, Tiesse, Basso, Ferguson, Foyewa. Adam Stansfield, pictured above, has told the Evening News that it is frustrating to be on the bench for Hereford United. As reported by Bulls News earlier this week Stansfield was voted Nationwide Conference player of the month for September. He admits he was surprised to be chosen. "I was surprised even to be shortlisted, let alone winning the award. I did not play that many games in the month. "I scored three goals and probably won the award because of the two I got at Leigh after coming off the bench. They were important goals because at the time we were struggling for a result." Obviously disappointed not to starting every game Stansfield still says he is enjoying life at Edgar Street. "It's always frustrating to be on the bench, but it's a team game and the manager has to pick the two strikers that he thinks will do the job. "I have to respect that and make sure that I do as well as I can when I get the chance. David Brown and Lee Mills have got so much experience, that it's always going to be difficult to work your way in. "I always look to score 20 to 25 goals a season and there is still a chance I can get that many this season." Meanwhile Hereford United are playing Luton in an under 18 game this morning.